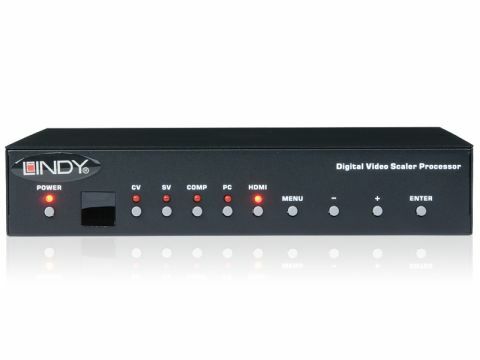 Designed to act as, or replace the front end of a display, the Lindy HDMI Scaler has several functions – source-selector, analogue-to-digital converter, signal processor/deinterlacer and the actual scaling bit. They're usually big and expensive boxes, but here's an unpretentious mini-alternative. Lindy's HDMI Scaler/Switch will convert analogue sources to HDMI 1.2. There's also a single HDMI 1080p input, plus audio support. Picture quality is surprisingly good for the price, although more expensive units are better equipped to extract the last ounce of AV source quality. Each input benefits from its own settings memory – in addition to contrast/brightness are colour temperature, noise-reduction, position and basic aspect-ratio. A wide range of output settings are provided including VGA to WUXGA, and 480i/576i to 1080p. Not as well featured as a some scalers; you don't get modes like PiP, a wide range of aspect-ratio settings, comprehensive control over deinterlacing/gamma correction or useful tweaks like chroma delay. In addition, the only output is HDMI/DVI, so you can't use this scaler with older displays that have VGA/RGB-HV as their highest-quality option.